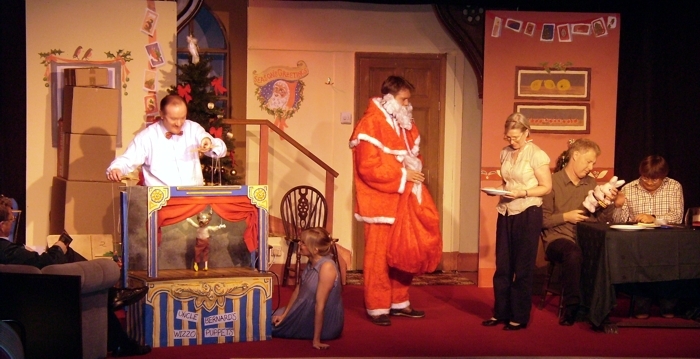 Farce is notoriously difficult for amateur actors to do well, but DADS pulled it off with their pre-Christmas production of Alan Ayckbourn’s Season’s Greetings. It is Christmas Eve and we are in the home of Belinda and Neville Bunker. The three-day festive period has begun and with it the usual stresses and strains that a family Christmas can bring. Some of the guests are already there, Uncle Howard, Pattie and Eddie and Rachel, who blows in having failed to pick up her new man from the railway station, said to be a famous author. Has he stood her up we wonder? No sooner has she arrived than she is off to meet the next train without much hope. She is to be surprised, in more ways than one, however, as events unfold. Uncle Howard is bellicose, not avuncular, and as it turns out carries a gun. Something of a spoilsport, he spends most of his time in front of the TV relishing the old films and insisting on gingerwine not ginger beer and castigating all and sundry over their behaviour. Nicely played by Geoff Russell, he turns out to be someone whose behaviour gets even odder as the play draws to a close. Rosemary Mills played Belinda, wife of Neville Bunker, with the sort of polished performance we have come to expect from her. She and Clive were irresistibly drawn to each other, but all they could manage was a quick fumble under the Christmas tree. Mark Wilkin as ‘Nev’ gave a convincing performance as her much put-upon husband who has a talent for fixing things – mainly malfunctioning presents and Christmas tree lights and loud music by remote control, of which he is very proud: not a man you can rely on to help on the domestic front.This is left to his sister Phyllis (Maxine Ford), a walking disaster in the thankfully off-stage kitchen, where she struggles to produce dinner while coping with nosebleeds, falls and an over-indulgence in the liquid variety of Christmas spirit. She came into her own playing a drunken game of snakes and ladders and flirting outrageously with the newcomer in their midst. 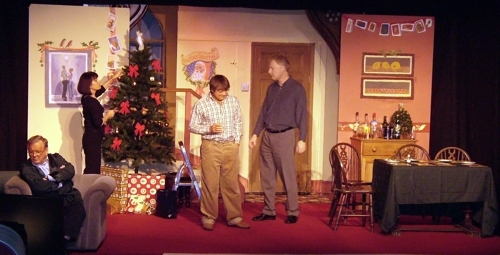 This was Clive ‘the writer’, suitably tall (blond) and handsome and played by Alex Watts, who was well cast. Poor Rachel (Jane Cannon) who invited him didn’t have quite the sexual allure and charms of her sister, Belinda.Jane played her as a wonderfully morose spinster who had something of an epiphany later on in the proceedings, regarding her catalogue of failed relationships with men. They left friends rather than lovers but better off because of it, given the example of all the other couples in the household. Mark Johnson as Eddie, henpecked and useless, played his part very convincingly. Married to Pattie (Lucie Hall), a woman one felt on the verge of a nervous breakdown and pregnant as well, she complemented her inept husband beautifully. And last but by no means least, Dr Bernard Longstaff, an ineffectual doctor but off duty, a children’s entertainer who came into his own at Christmas. 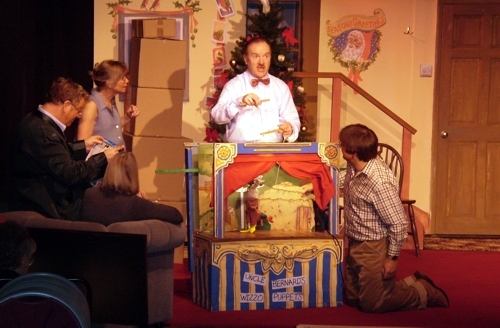 This year it was to be a puppet show of the Three Little Pigs. Mark Williams displayed his comic timing and acting ability to the full. In a very strong cast, he stole the show. There was a lot of very good comic acting going on even when he was not centre stage, and to great effect. His undeniable fury at Pattie for being so ineffective in handing him exactly the right Little Pig for his puppet show was a treat. Elsewhere, as the long-suffering husband of Phyllis, he proceeded to pour oil on troubled waters at every opportunity though to little effect. When Uncle Howard ‘shot’ Clive very early on the morning after Boxing Day – he was trying to catch an early train – Dr Longstaff pronounced him dead only to see the ‘corpse’ stir into life sufficiently to be carted off to casualty. Although useless professionally and socially in many ways, the hapless doctor attracted more sympathy than the rest of the assembled company. Ayckbourn is all about relationships, husbands and wives, brothers and sisters, uncles and cousins and countless other variations. InSeason’s Greetings each ‘couple’ is given centre stage, where we see them in their true colours, and then he deftly moves on to the next pairing. This was very well handled in this well-paced and tightly directed production by Terry Chipperfield. The set allowed for simultaneous action in separate rooms. Designed and constructed by Colin Newton, David Joseph and Michael Herbert to great effect, it was also robust enough to withstand a good deal of coming and going. 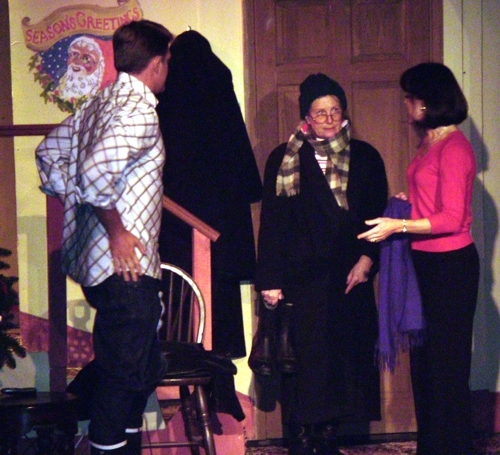 All concerned should be congratulated on getting actors on and off the stage effectively and making excellent use of a very tight space. 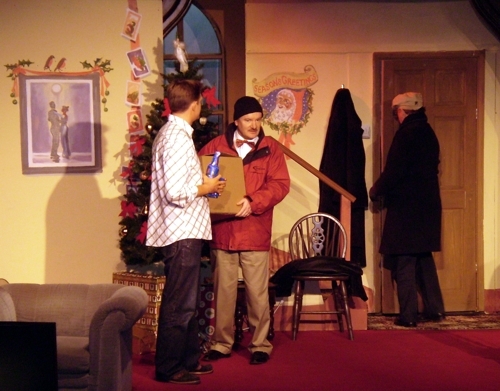 Mention must also be made of the sound and lighting by Simon Ratliff, which admirably complemented the set. 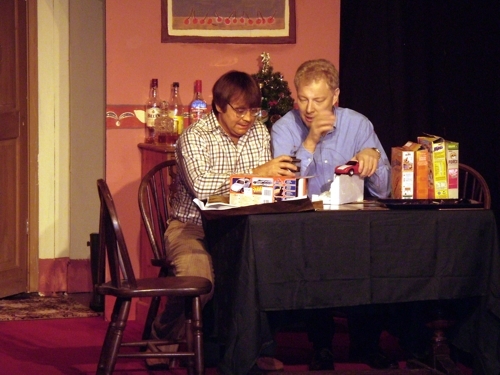 Ayckbourn manages to combine humour with pathos, and DADS did him justice. 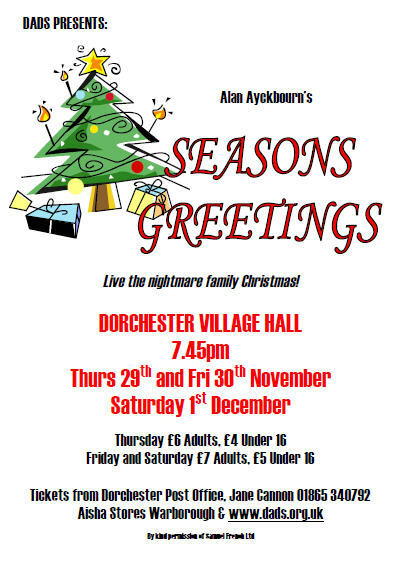 This was an excellent choice of play to get the audiences in festive mood and rejoice in the fact that the Bunkers and all their ghastly friends and relations don’t live anywhere near Dorchester on Thames.